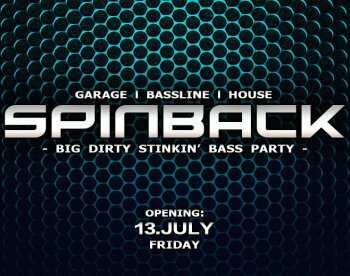 SPINBACK - The Bassline Club - Opening Party! The party crowd of Vienna seems to be hungry for something fresh & different, and to remedy this ..
we got together with some of the wildest DJs of the Viennese underground electronic scene to bring the missing flavours like holy flames to the nightlife of the city. Focusing on catchy rhythms, dirty beats & heavy basslines, from old school UKG classics, til the freshest & grooviest bangers of Bassline House & our favourite subgenres in House and other Bass Music. Get ready! We’ll make you dance ‘til the sun finds us again!